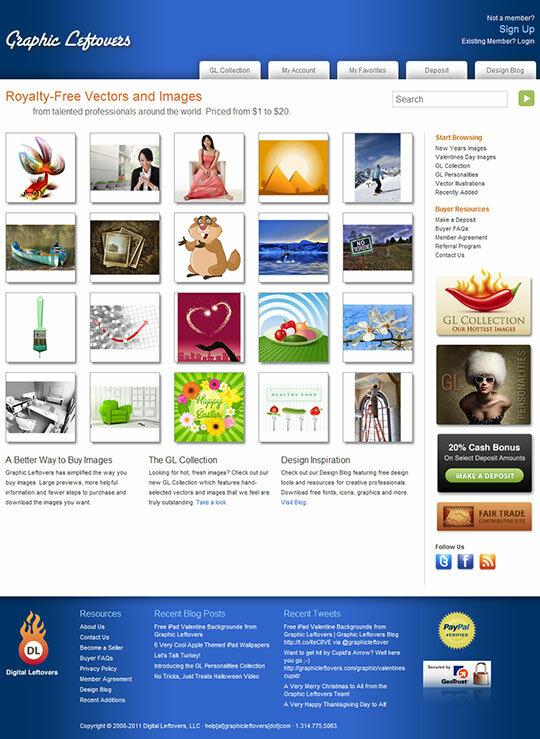 In this microstock agency you can set your own prices for each of your images – from $1 to $20. Your revenue is 52% – Graphic Leftovers is a Fair Trade Contributor Site. Most of other microstock sites offer much smaller revenue – 15, 20, 30 percent. At the beginning I didn’t have much sales with my portfolio (only 300 illustrations), but because of the price (I let there the default value $6), the income was nice. In September and November the earnings from Graphic Leftovers was about 25 percent of the earnings from BigStock or 123RF (but the portfolio size was different – GL about 300 images, BS and 123 around 2500 images). In December I had already 1000 images on Graphic Leftovers and the earnings were same as on BS and 123! January was quite weak (about 50%), but February much better (80%). I had to mention, that on GL I still have only half of my portfolio. I think, that I can reach interesting results once I upload whole my portfolio (around 3000 images). upload is very easy – just upload files via FTP. That’s all (in case you have title, description and keywords in IPTC), you don’t need to press any button on the site, choose categories etc. Graphic Leftowers is a good agency for microstock veterans (people who have several hundreds images in their portfolio) – if you have just few images, you will wait long for your first sale. Thanks for info, it is fixed now. Good to see your back writing articles. Thanks for the info on Graphic Leftovers! I’m also a contributor in graphicleftovers, but i couldn’t say many good words about it – with my 350 images portfolio i had only 3 sales (6 dollars each )in more than three moths. Could You tell, how many images do you sell here during moth? I’m just interested, because recently i’m thinking is it worth for me to keep uploading files there? Beasides, what do You think about vectorstock.com? Do You sell vectors there? I have there around 1200 vectors and I sell there about 20 images/month. I know vectorstock.com, but I don’t like the site much, because they dont have FTP for upload :( So I have there much smaller portfolio and much smaller earnings. well, i think You have really good sales at graphicleftovers. I recently changed some of my images prices from default 6 to smaller – 3 or 1 dollars. If even after that my sales will not get better, i think i’ll stop uploading there. How is Your success in canstockphoto.com? some of microstockers in different blogs mentioned, that their sales there recently suddenly got much better. How about You – did You experiened sales jump there recently? tried to Shutterstock an this was very frustrating. But graphicleftovers is ultra mega big brilliant fantastic. I´m a Greenhorn about Stock-Fotos. But at this page it was very easy to get starting. I have upload 30 foto an illustration. But this nothing compared to your 1000. Maybe get to sell one. I have on suggestion for you! sales on Canstockphoto are slightly better than on GL, but my portfolio on CanStock is 2× bigger. So GraphicLeftowers are better for me :) And also the upload process is a bit easier – just FTP upload. Graphic Leftovers rocks. Unfortunately sales are rather inconsistent for me, but I’m averaging more than Bigstock / 123RF. I see the extra 2% as a gesture showing they’re willing to pay the artist more than they get from each sale, and I hope they never change their strategy. A better referral system like the one of Dreamstime would be the icing of the cake.